In an ideal world, we would never have to win back the customer’s attention because our business would be at the front of their minds every time they wanted to purchase something. However, this only happens in our dreams. 21st century economics means we have to compete and struggle for every customer’s attention, which costs us time and money. So, once we have it, we should keep it for as long as possible. Why do we need reactivation email campaigns? Everything seems smooth when customers are engaged with your brand and regularly make a purchase from your store. But what should you do if they start slipping away? One of the ways to re-activate customers when they lose interest and stop making purchases is to send them a reactivation email campaign. Currently, only one third of merchants take advantage of this kind of email. However, for those that do send them, 89% of companies claim they are effective. Usually, merchants use automated workflows, which detect inactive users and send them a win-back email or series of emails. As this is the last chance to re-engage with an already inactive customer, merchants use all their available trumps: discounts, free shipping, personal gifts, etc. The vast majority of emails use the same elements, but set the focus on different things. Let’s look further at how these should appear and what they should say to achieve the best results. Personally, I love this email because of its emotional appeal. It is unexpected, cute, funny and motivational! The puppy catches your attention and spot-on copywriting makes you feel that Glotrition really knows what you are thinking and what you need. The “SHOP NOW” button is also in the right position and readers feel motivated enough to click it. Ken Orwig touches upon the differences between emotional vs. rational decisions in marketing. 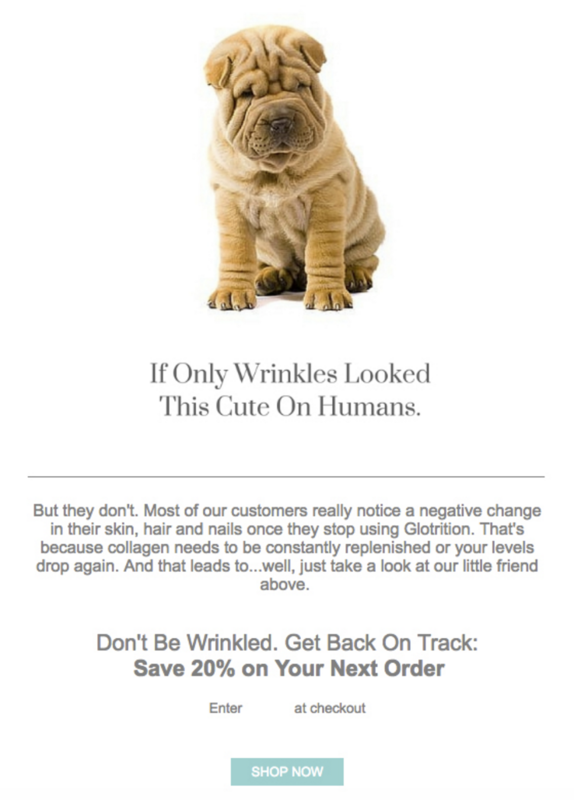 The email conception above uses the strategy discussed in the article: the wrinkled puppy creates the emotion and the copywriting gives you facts to encourage, and justify your decision to buy. NZ Tools from New Zealand send a series of three reactivation emails. In this series, you will see the most popular wording for this kind of email. 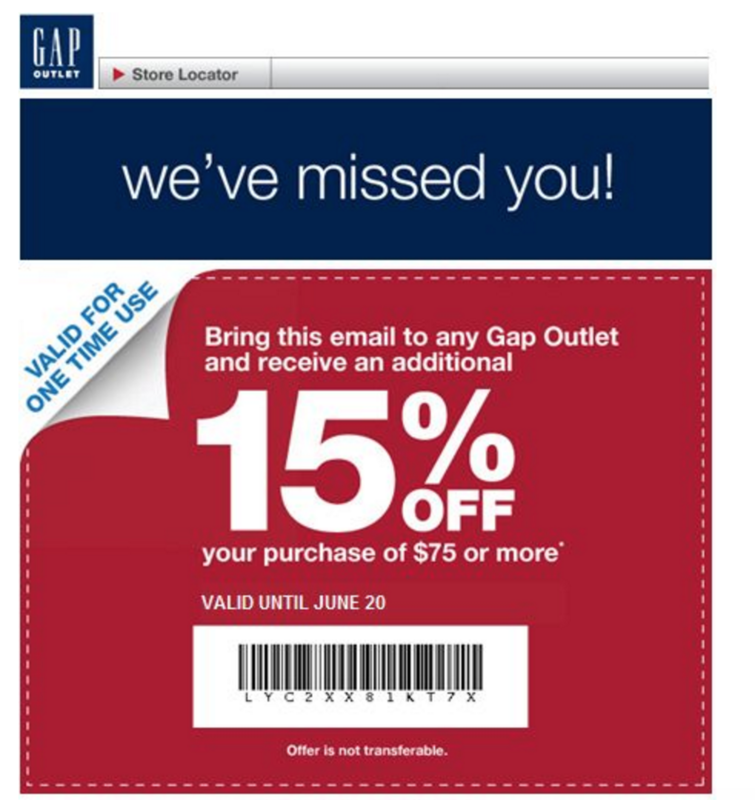 This example is minimalistic, simple and uses a classic reactivation email formula – “miss you” + invitation to come back + discount as an additional incentive to visit a store once again. This series is also an example of how merchants solve the email design. If you have no photos from your photoshoots, or have doubts about them, typography can be your solution. Images with nice fonts can replace other graphic elements and make your email look good. In contrast to the previous example, this email focuses on discounts more than your feelings towards the customer. It is straight to the point, offering a 15% discount. This strategy works well because the financial benefits are often the main motivators for non-engaged recipients to come back to your store and take a look once again. By the way, did you know that offering dollar discounts in most cases works better than offering a percent discount? In some A/B tests, merchants have received up to 170% better conversion rates by offering dollar discounts in comparison to percent discounts. Here, on Quora.com, you can find even more interesting facts and studies about discount effectiveness. This might be extremely useful when building either your promotional or automated reactivation email. Winning back customers is an endless task for any ecommerce merchant. Reactivation emails are only one out of dozens of automated workflows that can make your email marketing efforts more profitable. There are even more ecommerce emails that could be added to your communication strategy. Set up their workflows now and enjoy your email marketing 24/7. Author: Karolina Petraškienė is a digital communicator, content marketer and email enthusiast at Omnisend. Check out their recent ecommerce email marketing infographic!